In my never ending search for the perfect Paris café, I have come accross a corner on rue Jouffroy d’Abbans and avenue Villiers that has the most wonderful exposition to the afternoon and evening sun. Sadly the cafés that succeeded each other here never really inspired me… until now. The latest café is a cozy très industrial-chic meets scandi-style bistrot that just oozes comfort and good food. The owner of the café decided it was time to stop renting out the walls to failed restaurateurs and open his own place, in his own image. Café Gabrielle, is the name of his daughter, and now the name of my new favorite café. The décor and ambiance is extremely important to me when I go out for a drink or a meal, and Gabrielle has everything my déco heart desires. Warm velvety blues are set against a slew of neutral tones and natural textures with lighting to die for. (The chandeliers over the bar cost 5k each!). It is simple and elegant without making you feel like you need to wear your best French fashion; no, you can show up for lunch in jeans with your stroller in tow and a hungry baby who likes to bang spoons on the table. And that’s what Chéri and I did one afternoon when we were on a Spring staycation in Paris. (I get a kick of telling people that I am going to Paris when they ask where I am going on vacation. It takes them by surprise and sounds more fun than saying, « we’re not traveling ». 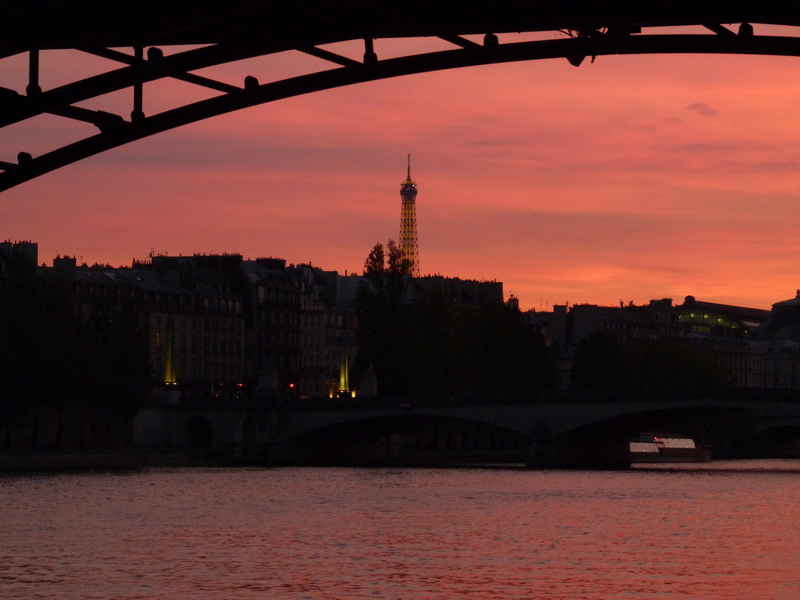 Besides, I am lucky enough to live in Paris, I like to enjoy it when I have time off work!). Back to Gabrielle… what makes this place so attractive to me is not only the harmony of the décor but also the absolutely friendly staff (the manager was very convincing and got us to reserve a table three days ahead of time). So I bet you are wondering what I have to say about the food huh? I had the roasted chicken that the manager had told me about three days before, and which I had been looking forward to that whole time. It’s a five hours slow roast that is juicy to the middle and absolutely divine served goldened from the broiler with homemade mashed potatoes and tangy gravy. Mmmm. Chéri had an AAA grade Andouiette savory pie that was on the daily specials, not my kind of thing, but he loved it. I was a little jealous of his dessert though, a « pain perdu » brioche with salted caramel sauce and ice cream. Oooooh heaven. I had a deconstructed lemon pie. I love lemon pie so I am a harsh critic, and although the flavor was great I didn’t care for the deconstructed part, as interesting as it sounded when I had ordered it. And the meringue has been slightly toasted with a caramelizing torch, but I could taste that blackened sugar flavor that comes from over-torching. Next time I will get the « pain perdu » brioche. But as great as this address is for food and décor, I also love it as a chic place to relax with an apéritif or evening drink during the week. It has a spacious terrace as well as little tables in the windows for those cold days. Beware though they close early on the weekend (great for the staff!) and a happy staff = good service. Café Gabrielle is easy to access from line 3 (Métro Wagram) or bus 31. It’s not too far from Parc Monceau, and just a short ride away from the Arc de Triomphe. I do recommend reserving though, there is a high demand for a table here. This place sounds wonderful for my next visit to the City of Lights!